Romance writer Bronte Huntington has vowed she will never settle for anything less than ‘the one.’ When pleasant red-haired dentist Ryan moves in next door he just doesn't fit the bill. They have plenty in common but Bronte wants nothing more than friendship with him. Then it looks like Bronte’s dreams have finally come true when dashing Sebastian Fairfax rescues her on his horse after she has an accident in the countryside around her idyllic little cottage. Sebastian is tall, dark, handsome, and heir to a massive country estate! But is Sebastian the one? Or will Bronte’s romantic dreams of the perfect hero turn out to be as fictional as her novels? And will Bronte's temperamental cat ever stop getting in the way?! First of all..the cover: LOVE! The characters: Very Austen-esque. I had a had time picturing the main heroine as 30, she was written a bit like a spinster. Living alone in a cottage, writing novels and going to critique groups. When she trips and falls down a hill in the forest and sprains her ankle it compounded the problem. I finally settled on Royal Prince Henry look a like for the main male character Ben, but it took about 3/4 of the novel to not see him as a mop headed middle aged man as well. I wish the author would have used a bit more adjectives in her writing and not such a detached style. But I loved it none the less! There were several moments to snicker and swoon. A perfect, cozy chick lit pick, especially if you read fairy tales or Jane Austen. Emma grew up and lived in London, before falling in love and moving to Wales to marry her own hero. Emma now lives with her husband, children, and many animals in a small Welsh market town. She can often be found in rivers attempting to control an overexcited chocolate labrador. Number 1 Australian kindle bestseller, ‘His Secret Daughter’, is the heart-rending story of Iris, a woman falling in love with the father of her child. The only problem is she never told him they had a daughter. The beautiful landscape around her home gave Emma the inspiration for ‘The Green Hills of Home’, a tale of love and duty in which country girl Gwen struggles to save her family home and avoid her feelings for her handsome, suave new boss. Is he quite all he seems? ‘Just Desserts’ is a novella about confused chef Leah, who’s falling for her handsome French co-worker Jean-Claude, but meant to be marrying to Dan in just a few weeks! Who will she choose? 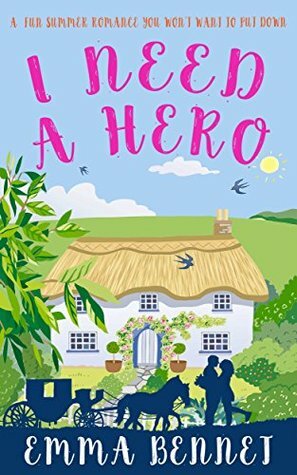 ‘I Need A Hero’ was released in July 2015, it’s a lovely comic romantic read for anyone who’s ever searched for Mr Right (and failed to find him!). Despair of Bronte, a romance writer, incapable of spotting when the perfect man is right next door! Full of horses, country houses and dentists, just beware of the foul-tempered cat Mr Darcy! Emma likes (in no particular order): cake, books, Cary Grant films, prosecco, chocolate, guinea pigs, knitting, quilting and happily ever afters!